It takes a thief less than one minute to steel your car. Most steering columns are made of plastic. It’s very easy to defeat your steering column to gain access to the ignition and start your car. BJ’s Auto Theft & Collision stocks a wide variety of parts for all makes and models. We are your one stop auto theft repair facility. We can repair or replace your steering column back to original factory equipment and re-code the lock cylinder back to its original key code. Older steering columns can be repaired and rebuilt. With some of the later models, the whole steering column needs to be replaced. Late model steering columns, in most cases, are not rebuild-able because they are typically sold as one unit and the manufacturer may not sell parts to repair them. 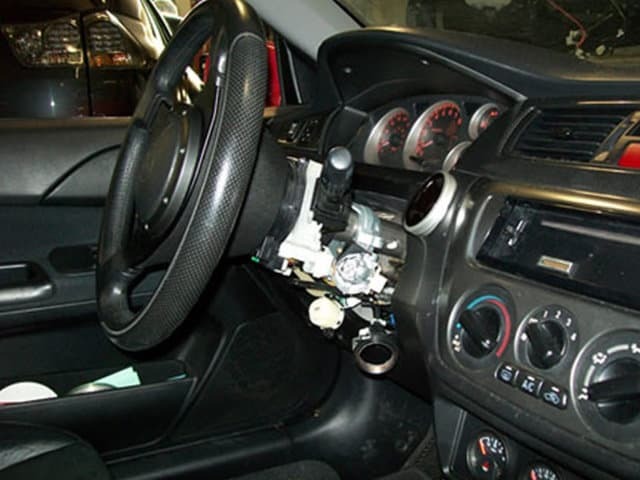 When a steering column is broken, it sometimes disables the airbag. Your vehicle may need an airbag clock spring (deploys the airbag) which is located in the steering column. One day service is available in most cases. We are recommended by all major insurance companies.